It looks like there is a new high-end Android tablet from Samsung on the way. Three new User Agent Profiles (UAProfs) have appeared that seem to line up with three different variants of the same tablet. UAProfs aren't the most reliable source of information, but if they are to be believed, it looks like a high-end Galaxy Tab 3 10.1 Plus could be on the horizon. The three UAProfs are for the SM-P900, SM-P901, and SM-P905 devices from Samsung. They are expected to line-up with the standard tablet variants of 3G (SM-900), WiFi-only (SM-901), and LTE (SM-905). There isn't a lot of info in the UAProfs, but the big info in there is that the tablets have display resolutions of 2560x1600, which puts them on par with the Nexus 10. All of the tablets are listed running Android 4.2 Jelly Bean, as well. The assumption is that the tablets are in the Galaxy Tab series because the "P" in a Samsung tablet model number tends to indicate that there is no S-Pen support, which would put these in the Tab series rather than Note. And, given the display resolution, it's likely that they are 10.1" tablets rather than a smaller screen size. We'll keep an eye out for more info. About time Sammy got into the high end tablet market. but if an 8 a15 it will just eat your battery. 8 A15 cores would drain your battery in an hour. sorry but the sales of the tablet Z is very poor, there is basically no marketing on it, and it seems like sony is not giving it enough attention. I personally tried playing around with the sony tablet Z and everything is working fine untill you hear the loud speaker, its very poor and making me not want to buy it anymore, and im sure many others especially the average consumer would agree. Playing music or games would sound horrible on it. 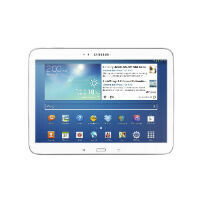 The " samsung galaxy tab three ten point one plus" a bit of a mouthfull...anyway specs look good. Bout time Samsung brings out a high end tablet. I've been looking for a replacement for my nexus 10 which annoys me at this point. Great specs, sh*try design. Typical Samsung.